City of Prussian Silesia. No precise information is forthcoming as to when Jews first settled in the city. The mention of Beuthen in the Mainzer Memorbuch (year 1231) is uncertain; but it is known that Jews lived there as early as 1421. The first documentary evidence relating to the Jews of Beuthendates from the year 1612. In 1617 there was one Jew there, Mauth Arendator by name; and in 1639 two more Jews were admitted to residence. In 1640 a Jew named Kretscham received from Count Gabriel Hentzel the privilege of establishing an inn, and in 1653 another received the right to sell liquor. In 1656 a court Jew resided here; and in the following year an investigation as to the number of Jews was made for the purpose of increasing the taxes. The responsa of Menahem Krochmal in 1657 mention the rabbinate of Beuthen. The Jews were often ill-treated and sought protection from the count, who, in 1688, wrote in their behalf to the city authorities. In 1715 there were only four families in Beuthen; in 1732 the Jews received a plot for a cemetery, the oldest tombstone still in existence dating from the year 1743. The number of families had in 1782 increased to twenty-three; and in the same year the first prayer-meetings were held in the house of the Boehm family. 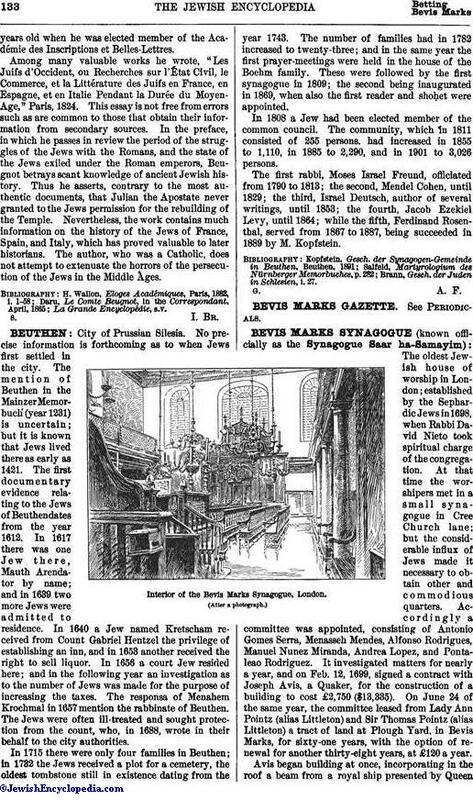 These were followed by the first synagogue in 1809; the second being inaugurated in 1869, when also the first reader and shoḥet were appointed. In 1808 a Jew had been elected member of the common council. The community, which in 1811 consisted of 255 persons, had increased in 1855 to 1,110, in 1885 to 2,290, and in 1901 to 3,026 persons. The first rabbi, Moses Israel Freund, officiated from 1790 to 1813; the second, Mendel Cohen, until 1829; the third, Israel Deutsch, author of several writings, until 1853; the fourth, Jacob Ezekiel Levy, until 1864; while the fifth, Ferdinand Rosenthal, served from 1867 to 1887, being succeeded in 1889 by M. Kopfstein. Brann, Gesch. der Juden in Schlesien, i. 27.